In the early 1970s I undertook an investigation of opal glasses to test their suitability for creating imagery in the opaque image vessels I was making at the time. I and my associate Dale Brownscombe formulated and melted all the opal systems we found in the literature, as well as a few unknown ones, and tested their suitability for my processes in my studio. One of the systems tested was titanium, which yielded very interesting results. One of them was extreme opacity, but perhaps because of that, it offered limited color possibilities. The results were also difficult to reproduce. Jump 40 years or so, to a batch workshop at Pete Vanderlaans where for some reason that formula was remelted. Again the glass was of extreme opacity which led to the thought it may be suited for filigrana work, which in the 70s, had yet to enter the studio consciousness. And again, it was difficult to reproduce. Realizing there were compelling reasons for using a titanium glass for filigrana work, about a year ago I began the Marko Blanko project to develop such a glass. Developing formulas, melting them, forming bars and then presenting them to highly skilled practitioners for evaluation and feedback eventually led to the glasses called Peiser White 180, which is a stiff, and Peiser Stiffer White 184 . The Marko Blanko glasses are striking titanium opaques and have some differing properties than the traditional lead/arsenic compositions. First, they contain no heavy metals, and would be considered non toxic. Titanium is considered an “elastic” in glass compositions. Peiser White 180 and Peiser Stiffer White 184 show no stress in a polariscope when matched with Spruce Pine Batch, expansion 96. These glasses have a different temp/visc curve than traditional compositions in that above the working range they are less viscous which facilitates pulling cane, while in the working range their viscosity rapidly increases and holds a very tight line. These titanium whites are less dense than the lead/arsenics by about 21%. 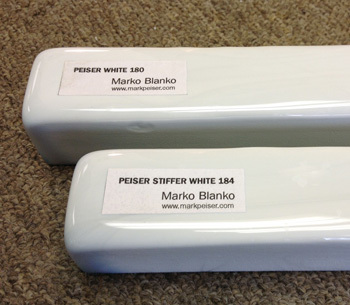 Therefore, a traditional 1kg bar has the same volume, the same amount of glass, as .79 kg, or 1.74 lbs., of Marko Blanko – it just weighs less. 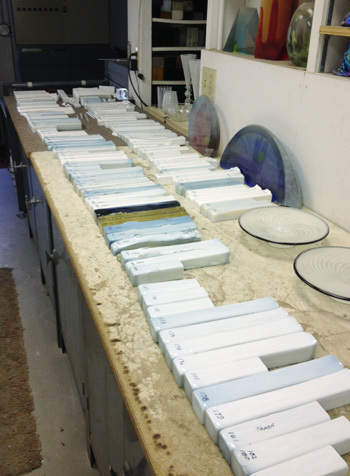 The current sample bars are not a finished product, but are a simplest testing method. The melts have been small and done under less than optimal conditions. There may be seeds or stones. Their somewhat off white color is the result of an incomplete spontaneous strike from the casting temperature. On reheating in an oxidizing fire a pure white titanium dioxide white will develop. A reducing flame will reduce the surface to a soft blue/grey. For the near future I am investigating the possibility of perhaps a 1000# run, which is beyond the scope of my studio, to produce quality bars that would be available for purchase and feedback. Check back for updates on the Marko Blanko Project.